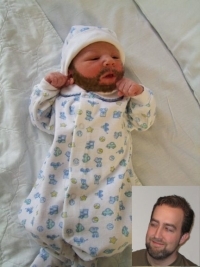 A little while ago, Dave made a twenty dollar bet with his wife that their newborn son would look more like him than her. A spitting image of his dad. Perhaps he doesn’t look exactly like that, but hey! I’m just trying to help a brutha’ out! Now stop gawking and go go wish them well!